A sincere adaptation of the Shakespeare play, Julius Caesar adheres to stage rules but still finds the passion at the heart of the story of intrigue and betrayal among Rome's elite. After defeating Rome's enemies, Julius Caesar (Louis Calhern) is at the height of his power, and the expectation is that the Senate will offer him the position of Emperor for life. Afraid that Caesar is becoming too ambitious and placing his personal glory ahead that of Rome, a group of noblemen plot an assassination. Cassius (John Gielgud) is the ring leader, and he invites the well respected Brutus (James Mason) to join the conspiracy, appealing to Brutus' love of Rome's ideal model of governance. After agonizing over the decision, Brutus joins the band of assassins, and Caesar is stabbed to death on the Ides of March. 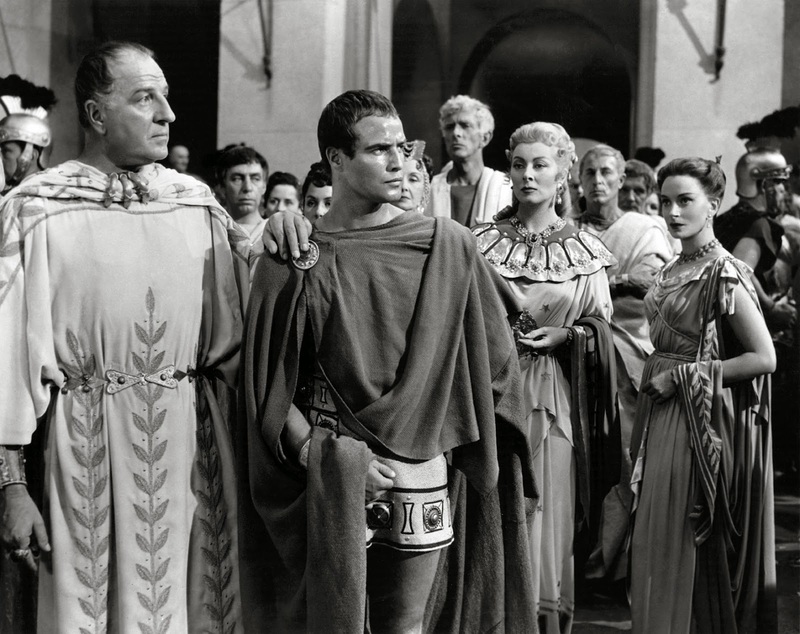 At the insistence of Brutus, and despite Cassius' unease, the killers spare the life of Caesar's loyal companion, the athletic Mark Antony (Marlon Brando). Antony pretends to be resigned to the will of the conspirators, but he uses his charisma and spectacular skills in oration to turn the public against the assassination, triggering a brutal battle for power. If Shakespeare needs to be filmed, it's likely best to do it this way: a stellar cast, lavish sets, and top production values. This takes away, somewhat, from lingering questions as to why the ancient Romans may choose to speak in 16th Century English. 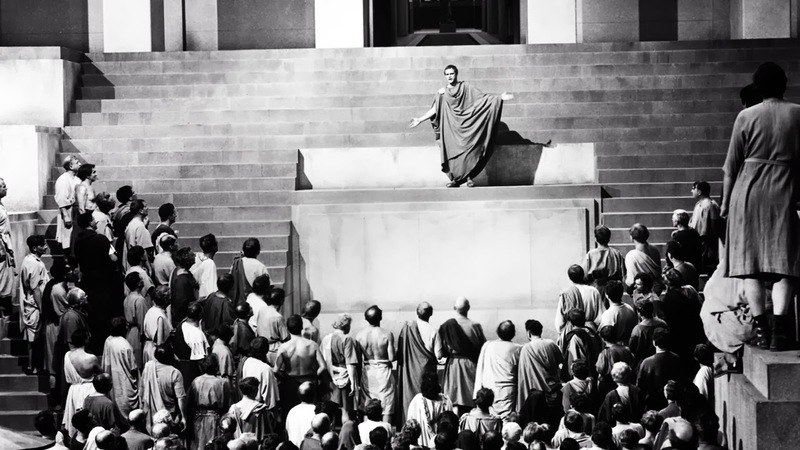 The trouble with Julius Caesar, as with any faithful movie adaptation of classic theatre, is the confines of dialogue written to dominate, where characters don't so much converse as trade volleys of soliloquies. This is forgivable in the cozy setting of the stage, but comes across as exceedingly stiff on the modern and expansive format of film. Julius Caesar overcomes these challenges as best at it could, thanks to Brando, Mason and Gielgud all delivering committed performances. Mason finds all of Brutus' intellectual self-doubt and higher purpose in defending Rome's reputation even at the cost of the ultimate betrayal. Gielgud is pure conspiratorial evil, his brooding Cassius the head of the plot but smart enough to acknowledge the importance of bringing Brutus into the fold. And Brando enjoys his one mammoth scene, roaring with rage to shake Romans out of their slumber and spark the civil war to oust the conspirators. Joseph L. Mankiewicz directs with appropriate reverence to the source material, packing the play into a tidy 121 minutes, and finding impressive-looking sets to stage the action. However, some of the dialogue is delivered breathlessly quickly, which does not help to convince that the characters are actually thinking before reciting their prose. Almost totally wasted are Deborah Kerr as Brutus' wife Portia, and Greer Garson as Caesar's wife Calpurnia. MGM likely wanted a star in every key role, but Kerr and Garson each get exactly one relevant scene, and then they both comprehensively disappear from the action, leaving the men behind to battle over the soul of Rome. Which is maybe just as well, as women are less likely to ever justify or condone the sordid backstabbing at the heart of the story. Riding the quality of the epic source material all the way to a bloody conclusion filled with perforated peers, Julius Caesar is a potent parable of power and politics.